“Too much and for too long, we seemed to have surrendered personal excellence and community values in the mere accumulation of material things. Our gross national product, […] if we judge the United States of America by that — counts air pollution and cigarette advertising, and ambulances to clear our highways of carnage. It counts special locks for our doors and the jails for the people who break them. It counts the destruction of the redwood and the loss of our natural wonder in chaotic sprawl. It counts napalm and counts nuclear warheads and armored cars for the police to fight the riots in our cities and the television programs which glorify violence in order to sell toys to our children. Yet the gross national product does not allow for the health of our children, the quality of their education or the joy of their play. It does not include the beauty of our poetry or the strength of our marriages, the intelligence of our public debate or the integrity of our public officials. It measures neither our wit nor our courage, neither our wisdom nor our learning, neither our compassion nor our devotion to our country, it measures everything in short, except that which makes life worthwhile.” — Senator Robert Kennedy, 1968 in Capra & Henderson (2013:2). As we have already explored in module one, we need to learn to distinguish between and shift from quantitative growth to qualitative growth. Our current economic system is designed to maximize the former and basically ignores the latter. We measure quantitative flow of money and economic growth in our national and global economies and interpret quantitative growth as an indicator of success. Yet, as Senator Kennedy’s famous 1968 speech made clear even then, many of the things that cost money and increase quantitative growth do not improve our society, while many the factors that contribute to our quality of life and thriving communities cannot be measured in monetary terms alone. No surprise we are confronted with short-sighted and mistaken political decision-making, if the main indicator of success we are using is insufficient. Using the volume of money flows as the core measure of societal wellbeing is clearly flawed. Equally, having to evaluate any important policy decision in order to ensure it leads to quantitative economic growth does not support wise decision-making. Yet, this is precisely what Gross Domestic Product (GDP), the dominant indicator currently in use, does in fact measure; and too often the economic growth imperative dominates political decision-making. It seems that most modern economists ignore this important advice by the very originator of GDP as one, and not the only, economic indicator of success. 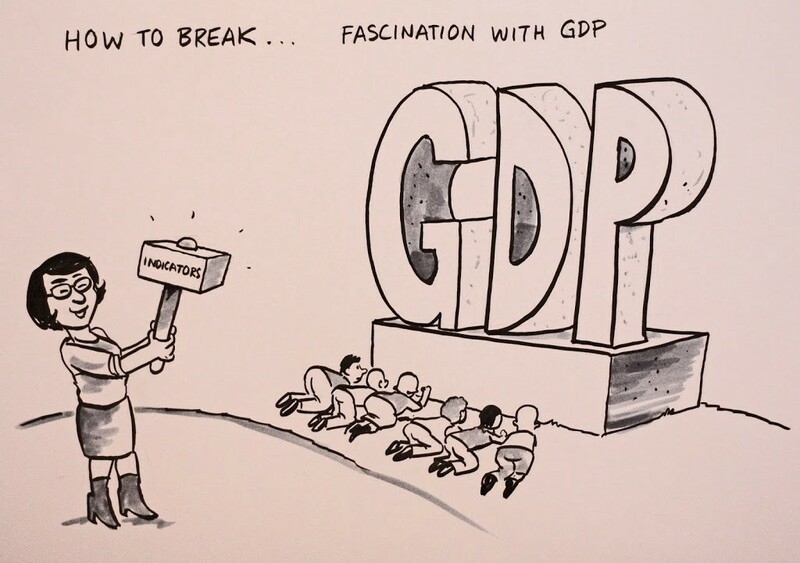 The one standard measure of human wellbeing today is GDP. It measures no more than the size of an economy, yet GDP as a general measure of success is so central to our economic analysis that our political leaders generally need do no more than announce at the end of every year the rate by which our economy has grown to assure the public that all is well. The common acceptance of GDP as our principal indicator and measure of wellbeing has helped define us as consumers. By increasing consumption, so the story goes, the economy grows and collective wellbeing grows with it. There is however, growing recognition of the limitations of GDP as a true measure of wellbeing. Many things are included in GDP that can scarcely be described as adding to the sum of happiness: consumption of cigarettes, traffic jams and accidents, ecological disasters that require major clean-up operations and war. All these could be said to have an adverse effect on human wellbeing while being “good” for the economy. 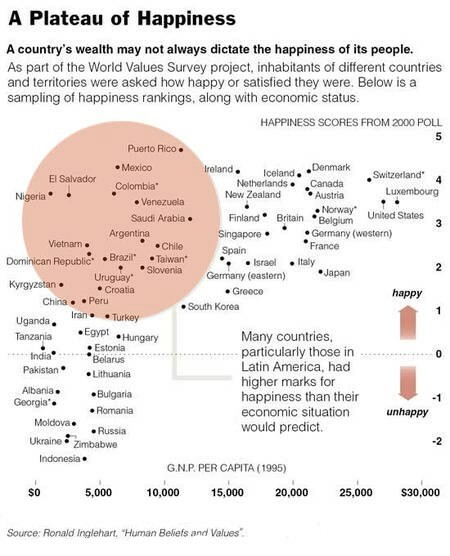 Similarly, there are many things that clearly do make us happy but that are not included in the measure of GDP: love, friendships, a vibrant and supportive community, volunteering, free time, …, the list is almost endless. To truly measure the wellbeing of individuals, communities and ecosystems, we need something more nuanced. In recent years, a growing number of alternative indicators have been developed — both at national and community levels. These alternative measures of progress seek to capture a more balanced and nuanced picture of human wellbeing and ecosystem health as the basis of a healthy economy. Alternative economic indicators offer substantial opportunity for us to begin, within the context of our own local communities, to redefine what constitutes true wellbeing and to put values — as in what we truly value — back at the heart of our economic life. In aiming to design economic indicators and both quantitative as well as qualitative measures of genuine progress, we need to pay closer attention to what is measured and in what way. Most alternative indicators are more complex and encompassing. They generally use GDP as one indicator among many and then integrate a diversity of indicators into an overall measure of success, progress or improvement. Among the additional quantitative and qualitative data included in these ‘whole systems’ measures are, for example, levels of (especially female) literacy, infant mortality rates, subjective feelings of wellbeing, numbers of doctors or teachers per head of population, size of ecological footprint, ecosystem health and so on. Many alternative indicators have been proposed. We will take a closer look at four examples of particularly informative alternative measures applied at the national and global scale. One of the best known sustainability indicators is the Genuine Progress Indicator (GPI) which, in addition to GDP, factors in a wide variety of indicators, including the costs of commuting, of transport accidents, of industrial accidents, of crime, of noise pollution, of irrigation water use, of water pollution, of air pollution, of land degradation, of loss of native forests, of depletion of non-renewable energy resources, of climate change, of ozone depletion, of problem gambling and many others. Here is a short video (2mins) about the overall difference between GDP and GPI as economic success indicators. We need Genuine Progress Indicators! While GDP has risen in the US GPI has dropped. Here is a list of what the Genuine Progress Indicator measures that GDP does not include. GDP per capita in purchasing power parity (PPP) terms in US dollars (GDP is also sometimes referred to as Gross National Income or GNI). The HDI has had a significant impact on drawing the attention of governments, corporations and international organizations to aspects of development that focus on the expansion of choices and freedoms, not just income. You can download the UNDP’s 2015 Human Development Report here in various languages. Here is a link to a short documentary (10mins) on the history of the UNDP’s Human Development Reports. The graphic below shows how various countries are performing with regard to the human development index and indicates the relative contributions made by the different factors that make up the HDI measure. The Happy Planet Index (HPI) is an innovative new measure developed by the London-based New Economics Foundation. It measures the ecological efficiency with which human well-being is delivered. The HPI is composed of just three indicators — longevity, subjective feelings of wellbeing and ecological footprint (see also module one). The Happy Planet Index seeks to identify how many resources citizens of different countries require to live long and happy lives. Here is Nic Marks, the inventor of the HPI, explaining how it works. 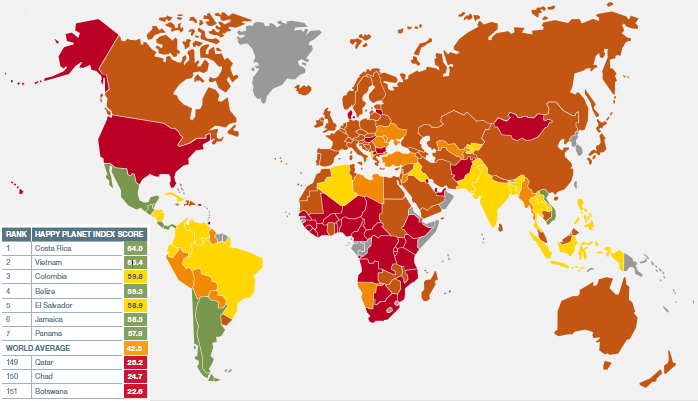 You can download a copy of the 2012 Happy Planet Index here. The Government of Bhutan has decided to measure the nation’s well-being in Gross National Happiness. The GNH concept is based on the premise that true development of human society takes place when material and spiritual development occur side by side to complement and reinforce each other. The four pillars of GNH are the promotion of equitable and sustainable socio-economic development, preservation and promotion of cultural values, conservation of the natural environment and establishment of good governance. 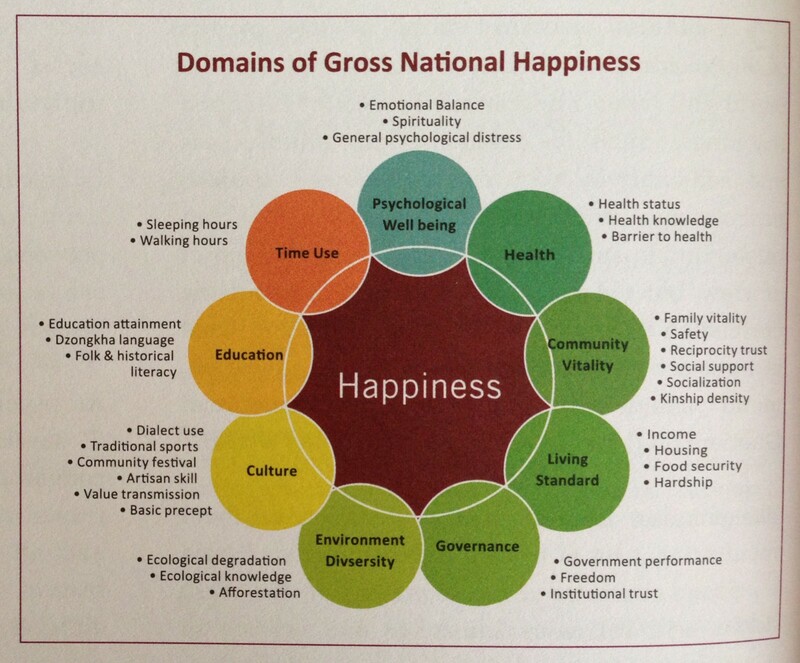 Here is a short video (3:30mins) explaining the history of Buthan’s Gross National Happiness approach. Interestingly, most studies based on national and international alternative indicators find that in the industrialised countries of the North, wellbeing grew in parallel with GDP until around the mid-1970s. 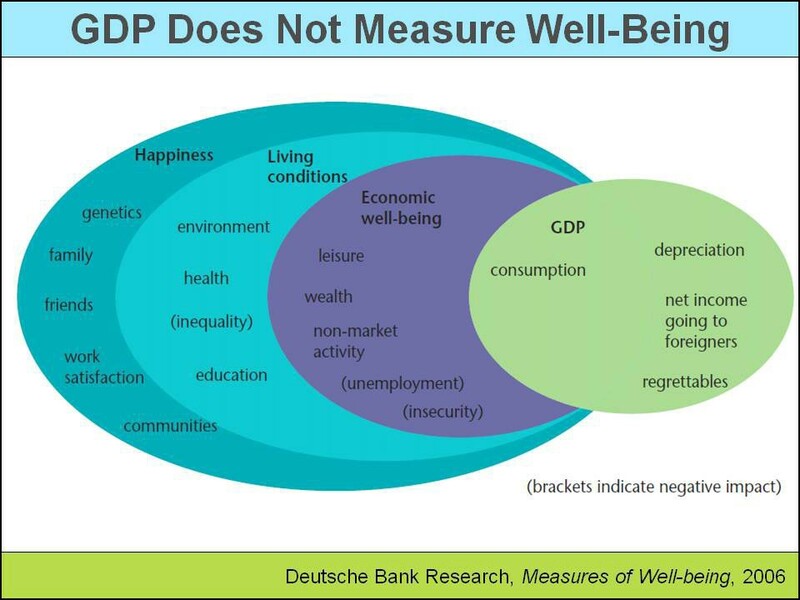 Since that point, however, while GDP has continued upwards, most measures of wellbeing have evened out or fallen. The strong implication is that beyond a certain level of material wealth, a point long since passed in the industrialised world, the correlation between economic growth and societal wellbeing is very weak, as can be seen from the graph below. 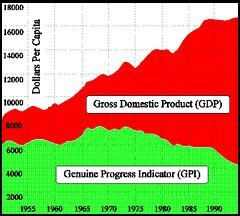 While GDP has risen there has actually been no genuine progress in peoples level of well being since the 1970s. Whether we employ the GPI, HDI, HPI, or the GNH approach, what really matters is that we begin to measure the success of our economy and the wellbeing of our societies with more diverse measures than only GDP. Even more important in this shift than the actual numeric or ranking measurements is the holistic approach and the whole systems thinking that we are invited into as we widen the range of tools we use to give us indications on whether we are doing well. We need multiple perspectives and systemic thinking supported by diverse indicators if we hope to chart a wise path into an uncertain and complex future. You can take a look at, or download, the 2015 World Happiness Report here. AUTHOR’S NOTE: This is an excerpt from the Economic Design Dimension of Gaia Education’s online course in Design for Sustainability, which I revised and re-wrote in 2015–2016 on the basis of an earlier version by Jonathan Dawson (now head of economics at Schumacher College). The 400 hour on-line course offers a whole systems design approach to taking part in the transition towards thriving communities, vibrant regional economies and diverse regenerative cultures everywhere. The 2019 Economic Design Dimension starts on March 18th. Enroll now! The above is a little preview of the nearly 140 pages of text, links and videos, that participants explore in the Economic Design Dimension under the guidance of experience tutors and as part of a global community of learners. For more information take a look at the content of this on-line training for global-local change agents in economic design. Much of the material I used in authoring the curriculum content for this course is based on the years of research I did for my recently published book Designing Regenerative Cultures.